It’s the Tenth Day of Christmas Knitting, and oh dear, this sweet season is almost over. My waistline will thank me, but my spirit does not. The seasons have their purposes in coming and goings, but I do look forward to when every day is celebration and rest. Day Ten brings us to the number Three, and another gift from my mom: not a thing knit, but a thing to be knit. I am a planner. An over-planner, at least when it comes to my hobbies. How else could I justify the time and resources spent buying yarn and browsing ravelry? All this means that when I get around to something in my queue, it’s been there so long that it can’t possibly live up to the hype of having been eagerly anticipated for two-to-five years. So sometimes, it’s really nice to drop all the plans and impulsively cast on something brand new. That’s the gift Mum gave me this year. 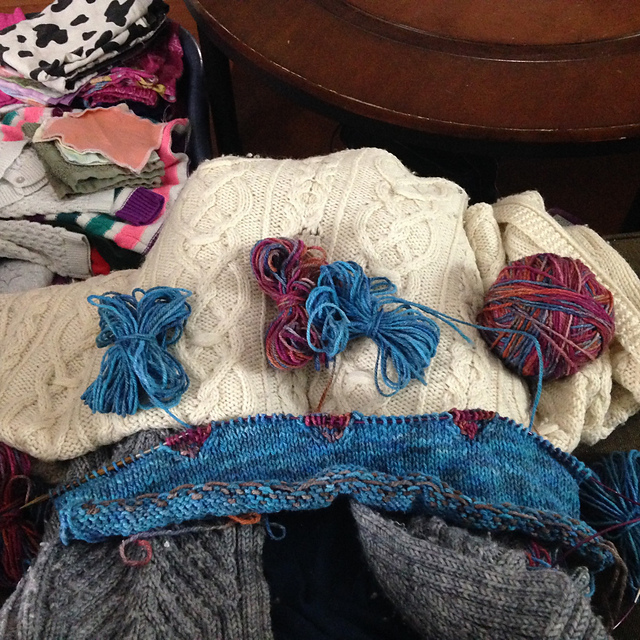 She found three beautiful colors of a wool/wilk yarn called “Rinihue” from Araucania (Imagine tildes over both those “n”s), and a bag pattern in a special issue of Interweave from a few years ago. The colors in this stuff are just delicious. One small issue presented itself: this yarn is not remotely the same weight as the super-bulky yarn in the pattern. I don’t know whether Mum had some kind of gauge seizure or just has absolute confidence in my design capabilities, but let’s go with the latter. It hardly mattered, because I decided instantly that I would not be making a shoulder bag with this yarn, but a laptop case. Swatch plus math determined that tripling the number of diamonds in the pattern would exactly fit the width of my laptop, upping visual interest, argyle style, and knitting entertainment. Ah, the joy of positioning myself on the couch with seven balls of yarn arranged before me. If you are specific and cautious about how you turn your work at the end of a row, it’s possible to work complex intarsia without ever having to untangle the threads. You wrap them all one way, turn, and unwrap them on the way back. Turn again to find all your strands ship-shape, and you will be rewarded with a satisfaction rivaling that of getting two toddlers asleep by 7:30 p.m. The blue is my favorite of the three colors. You can hardly tell in my lousy mobile pictures, but it has rich depths of hue and tone. I learned a brand new-to-me technique: shaped intarsia. 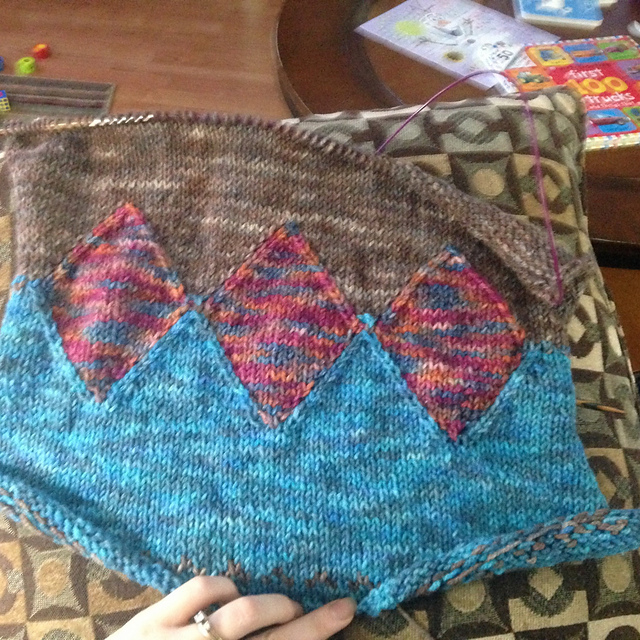 It creates beautiful lines where regular intarsia would have jagged edges. 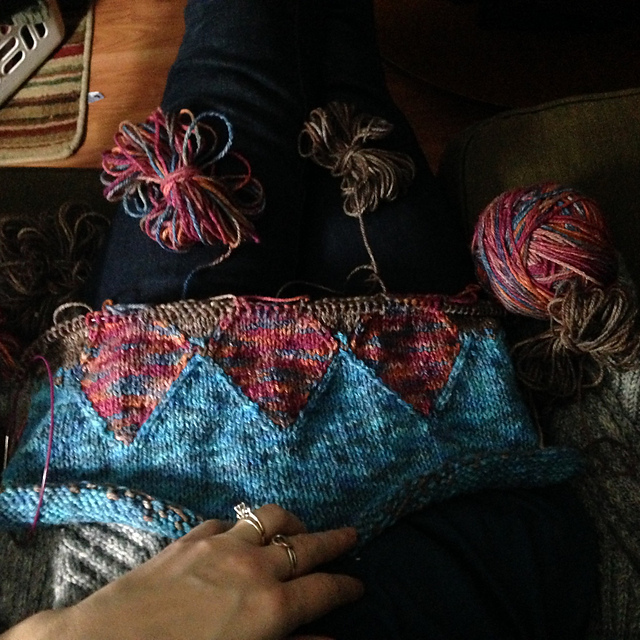 I stopped to weave in the plethora of ends after the first set of diamonds, and am toodling down the plain stretch. I may have to rejigger things again though. Row gauge, oh row gauge, you are my bane! I have another ten rows to go before the top matches the bottom, and this front piece is already as long as my laptop. I wonder if this stuff will felt. What are you doing for pure enjoyment this Christmas season? Three days left, plus Epiphany, so live it up!